Feminist Friday is a casual but directed conversation about contemporary issues related to feminism. This intersectional conversation is open to any and all community members. The purpose of Feminist Friday is to create a safe environment in which people can share questions, concerns, resources, and experiences pertaining to feminism. The ‘unofficial’ motto of Feminist Friday is “Cocktails, Conversation, and Consciousness-raising”. 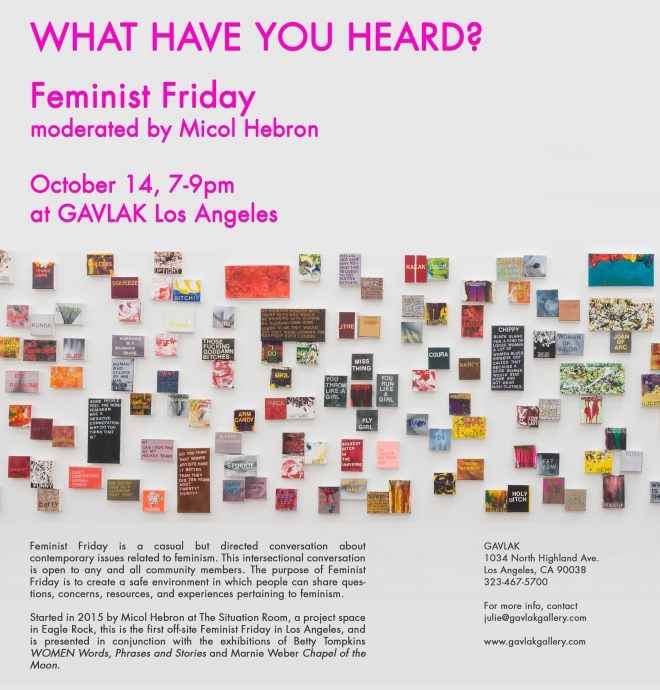 Started in 2015 by Micol Hebron at The Situation Room (project space in Eagle Rock), there have been numerous Feminist Friday events in Northeast LA, and around the US. This is the first off-site Feminist Friday in Los Angeles, and is presented in conjunction with Betty Tompkins WOMEN Words, Phrases and Stories. While any topic related to feminism is up for discussion at Feminist Friday, for this evening we are offering the theme "What Have You Heard? ", to enocurage participants to think about the roles of gossip, rumor, reputation, fact-checking, and media sensationalism in feminist discourse, and in politics. We invite you to come visit the powerful exhibitions of work by Thompkins and Weber - both of which are directly addressing the metaphoric and literal languages of the feminine and of feminism. What have YOU heard....about women artists? about other women? about feminism?about Hillary? about The Donald? about the upcoming election? Come share with us what you've heard, and what you'd like to hear!